I just wasn’t able to resist the desire to tattoo the Suicide Girl’s back. 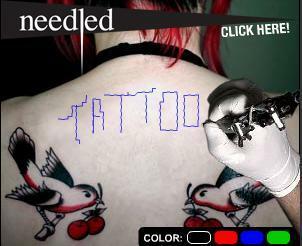 Even you can try your tattoo gun’s shots on the gorgeous girls at the Needled.com. The painless, temporary, and free design banner can of course give you a feeling of being on the artist’s chair, but lacks the real feeling. Don’t forget to hold it once. ← Read this before getting those ravishing Kanji tattoos!